As we publish this report, CDFA has just begun its centennial year. The story of California agriculture over the past century is a tale of growth and success. The engine of all of that productivity is, in a word, innovation. CDFA’s challenge has been to keep pace with – and in many cases to encourage – that progress. We provide an important framework that protects consumers; maintains a safe and efficient food supply; ensures fairness in the marketplace and in the avenues of commerce; and helps growers continue to innovate, modernize, and deliver the fruits of their productivity. My eight years with CDFA have shown me the breadth and depth of this agency’s service to consumers, farmers and ranchers; and also in terms of fostering an agricultural industry that embraces its role as a global leader on everything from the most technical aspects of farming to the broadest environmental imperatives. 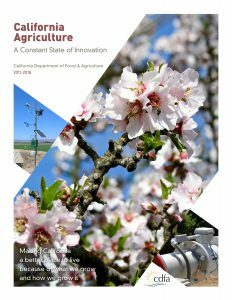 We offer this report to take stock of how CDFA fulfills its mission, and also to honor the innovative nature of California farmers and ranchers and all who support them. They show the nation and the world what is possible.